Sutherland, Stuart R.J.. "Jay's Treaty". The Canadian Encyclopedia, 18 September 2017, Historica Canada. https://www.thecanadianencyclopedia.ca/en/article/jays-treaty. Accessed 19 April 2019. Pamphlet containing the text of Jay's Treaty, 1795. 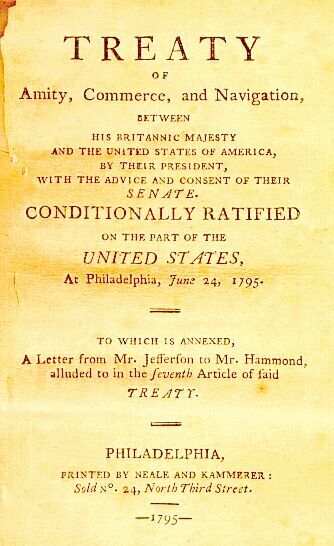 Treaty of Amity, Commerce and Navigation, between His Britannick Majesty; and the United States of America, by their President, with the Advice and Consent of their Senate, more commonly known as Jay’s Treaty or the Jay Treaty, signed 19 November 1794 in London, is a treaty between the United States and Britain. The product of trade and border negotiations, the treaty is known for its provision that allows Aboriginal people from Canada to live and work freely in the United States; the Canadian federal government does not recognize the reciprocal provision as binding. Jay's Treaty was named for John Jay, the Chief Justice of the United States and signatory to the document. The treaty was fully ratified on 28 October 1795, and proclaimed 29 February 1796. This primarily commercial agreement was intended to settle unresolved issues that threatened war, such as Britain’s retention of frontier posts in American territory after the Treaty of Paris (1783), American-Indigenous disputes over the Ohio Valley, and American anger over British seizure of shipping. The treaty stipulated that Britain would evacuate western posts by 1 June 1796, and that merchants from both the United States and British North America would have free access to lands on either side of the border. This included Aboriginal peoples, who were allowed to freely cross the international border — a provision that was included so thatMontréal fur trade companies’ ties to Aboriginal peoples in the northern Mississippi Valley would not be severed. The treaty also stipulated that the Mississippi River would be open to both countries, that a commission to settle debts to Britain since the start of the American Revolution would be established, and that American shipping would not be hindered in trade with British possessions. Jay’s Treaty also excludes Aboriginal people from paying duty on goods carried across the border. The negotiations and final agreement mark the revival of arbitration in international relations, since commissioners were appointed to settle outstanding boundary problems caused by the peace of 1783. Jay’s Treaty has important modern-day ramifications for Aboriginal rights. The United States government has established that Aboriginal people from Canada with “50% American Indian blood” may live and work in the United States without restriction. The treaty is not recognized as binding by Canada. The position of the government, in particular with regards to the payment of duty on goods, has periodically been challenged. In 1968, Mike Mitchell, a leader in the Mohawk community of Akwesasne, near Cornwall, ON, was arrested for failing to pay duty on a number of household items he had brought across the border. A blockade of the international bridge through the reserve followed in February 1969, after which Ottawa agreed to recognize the right to duty-free passage. The debate was reopened in 1988 when Mitchell again brought goods across the border and refused when asked to pay duty. In 2001, the Supreme Court of Canada ruled that the right to cross the border without paying duty is not an established Aboriginal right. In 2009, the Canadian Border Services Agency abandoned their station on reserve land before they were to be issued firearms as a result of new policy. Akwesasne groups had warned that armed agents would not be tolerated on reserve land, and despite calls from multiple authorities for negotiation the federal government ignored the issue. The border station remains abandoned, a reminder of the contentious nature of enforcing a border that cuts through Aboriginal territory.